(1 each/unit) S-series for 60% thru Tri-shield RG59 Coaxial Cable. Enhance your ability to deliver flawless analog and digital RF communications. 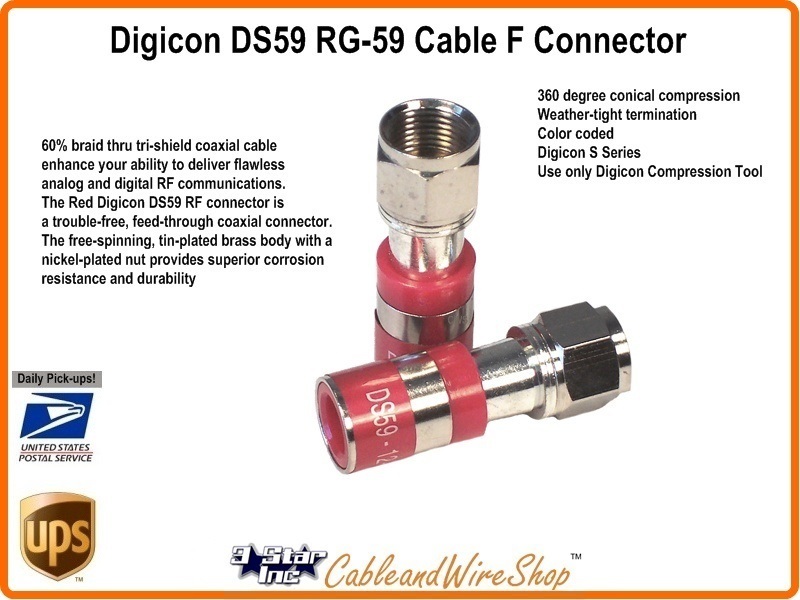 The Red Digicon DS59 RF connector is a trouble-free, feed-through coaxial connector. The free-spinning, tin-plated brass body with a nickel-plated nut provides superior corrosion resistance and durability. A 360 degree conical compression completely seals the F-connector around the cable jacket for increased electrical and mechanical performance, secure weathetight termination and enhanced pull-out strength. Machined brass sealing rings located in the final compression taper create a permanent water barrier at the F-connector base. A lubricated internal O-ring prevents moisture migration at the mandrel nut. A large ferrule contact surface ensures a proper RF and digital interface. The connector nut is 50% larger, 20% deeper with 30% more threads than typical RF connectors to allow a more firm grip and to provide a secure weathetight connection at the port interface. For professional results, use only the proper Digicon compression tool to install Digicon F-connectors. Note: The PCT PCT-DRS-CT F Connector Radial Compression Tool below has been designed by the manufacturer to work with several various types and models of connectors at half the cost. This connector is one of them! RG-59 is Flexible Coaxial Drop Cable used Primarily Today for CCTV (Closed Circuit TV) Applications. In the Early Days of Cable TV, 300 Ohm twin lead was used. When the transmission lines used changed to 75 Ohm Coaxial Cable, RG59 was introduced as the premise distribution cable of choice, installed in many Homes and Apartments that is still in use today. For the Higher Frequencies and Bandwidthes of Modern Cable TV design, RG59 is very lossy and should be replaced with a lower loss cable (like RG6) at any opportunity. We Sell RG59 Connectors for CCTV and Cable TV Antenna applications as there is still plenty of it still left in service. Modern Manufacture of RG59 sees almost every variety that you would find in RG6, though there is much, much less of it available. Quad Shield versions with Silver Clad center conductor are used in Head End wiring. 95% braid coverage suitable for use in CCTV willl have Solid Copper center conductor and Copper or Copper Clad Aluminum Braided Shield. Cable of this manufacture can be rated up to 3 GHz in bandwidth, but its loss usually precludes its use in anything other than CCTV Applications. Solid Copper center conductor is not needed for the carriage of Higher Frequencies, but rather for the lower loop resistance characteristics preferable for DC Voltage power into the Camera, and the Lower RF Frequencies found in Baseband Video out of the Camera. Lower frequency use such as this sees loss comparable to RG6 as the two are indistiguishable in this range. RG59 is smaller, more flexible, and easier to post-wire install. Solid Copper or Copper Clad Aluminum Shield maximizes Shield Integrity, maximizing rejection of unwanted interfering Signals. The most Popular Connector Series from Manufacturers like PCT, PPC, F-Conn, Thomas and Betts, Holland Electronics, Apica and Digicon offered in Legacy Hex Crimp styles as well as the Newer Radial Compression formats. Be Sure and match Connectors to their respective Crimping Tools by Manufacturer Spec. Sheet for Hex Diameter size or Compression length. Coaxial Cable Connectors should be weather protected in outdoor use, and some connectors provide extra moisture migration protection when compared to others. Though the economics of Old school Hex Crimp connectors and Tools may be attractive at first, over the long haul, compression connectors offer greater Shield Connection integrity, Bandwidth, Interference Rejection and Impedance matching when compared to their Hex Crimp counterparts. Whenever possible, upgrade Coaxial Cable, Connectors, Splitters and Amplifiers to ensure compliance to the latest specifications and formats.